Cover Line: One picture is worth a thousand screams. Book Description: Greg thinks there is something wrong with the old camera he and his friends found. The photographs keep turning out wrong. Very wrong. Like the snapshot Greg took of his father’s new car that shows it totalled. And then Greg’s father is in a nasty wreck. But Greg’s friends don’t believe him. Shari even makes Greg bring the camera to her birthday party and take her picture. Only Shari’s not in the photograph when it develops. Is Shari about to be taken out of the picture permanently? Who is going to take the next fall for… the evil camera? Autumn is her folks and with the fall season comes the best month of the year, October, which in turn brings two very awesome holidays, Halloween and … my birthday. Ok so my birthday might not mean much to anyone else, but for weirdos like me All Hallows’ Eve is the best holiday year round. Maybe it’s the hoodie weather, scary movies, candy, the creative costumes, or the display of wild yellow and orange trees contrasting with the blue sky. I don’t know. It’s like Christmas, but in October, and I say that mainly because I get presents this month… so it’s basically early Christmas for me. Yah know? Anyway. You know what October also brings? The long-awaited review of Say Cheese and Die! #4 in R.L. 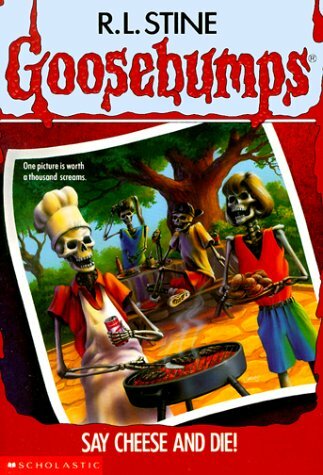 Stine’s Goosebumps series. I know I mentioned that this was next back in April, after I posted my thoughts on Monster Blood, so after a long summer and few days of procrastination, I’m dusting off the right side of my brain and getting back to work. The story begins in Pitts Landing, a place with a great motto, Pitts Landing is the pits. We find our main characters, Greg, Shari, Michael, and Doug a.k.a Bird, bored and looking for trouble. Not really, but that is what happens when a group of kids get bored. Eventually someone gets the idea to break into the old Coffman house where supposedly a homeless man named Spidey lives. See I told you, breaking and entering. While exploring the abandoned home they find themselves in the basement where Greg discovers a secret compartment that is hiding a peculiar camera. He asks one of his friends to strike a pose on the stair case leading upstairs when suddenly the railing breaks and sends Michael plummeting to the basement floor. The loud crash disturbs something upstairs as the gang hears footsteps heading their way. They narrowly escape out a cellar door leads to the back yard. Once away from the house, or after achieving a successful break-in, Michael demands to see the photo. Everyone, at first, is shocked but then decide the camera must be broken because it took a photo of Michael as he was falling from the stairwell. Everyone splits up for the night and goes home. Broken camera toting Greg is excited to see a brand new Station Wagon and can’t help but try another picture. The polaroid-like camera spits out the developing picture. When finally upstairs Greg is confused to see that in the picture the car looks totaled. He is then nervously gathered with the rest of the family to go for a ride in the new wagon. Thankfully everyone arrive back home safely, barring a close call with a truck, but Greg is just not sure what is up with the camera. To prove one more time to see if it’s broken he asks his brother if he can take his photo. The result is completely different, Terry, his brother is standing outside in the photo and not inside where he took the picture and he has a terrifying expression on his face. This reassures Greg that the camera must be broken, because what kind of camera takes a picture with different backgrounds…. After another weird incident at his friend Bird’s baseball game and Greg’s sees his brothers terrifying expression and finds out his dad actually got into a wreck and totaled the car after all, Shari asks Greg to bring the camera to her birthday party because she thinks it will be fun. Why? I don’t know. But after a couple of shots of Shari standing by a tree, the pictures develop without Shari in them. Everyone brushes it off and decides to play hide and seek, when Shari actually disappears for real. The cops come send Greg home after he tries to explain how his broken camera might be magic because of the things that are happening after he takes photos of people. Worried about Shari, Greg gets home and finds his room has been destroyed. He quickly figures that Spidey has been looking for the camera. He quickly gathers Bird, and Michael to plan a way to get rid of it, when they are harassed by two bullies who try to take the camera and accidentally take a photo of Greg during the struggle. After escaping and making it back home, Greg goes nuts for a moment after he sees the photo taken of him portrays him and Shari at the baseball diamond cowering under a tall shadow. In a sudden rage he tears up the two photos of the tree sans Sheri, because as if puberty isn’t rough enough the poor kid is dealing with supernatural forces too. Two hours after they are destroyed, Shari calls Greg. Happy his friend is alive he asks to meet with her the next day at the baseball diamonds… for some reason he wants the picture to come true obviously. Once there they try to make a plan to get rid of the camera, but are interrupted by Spidey, the tall shadow in the photo, who chases them down until a neighbor sees them and threatens to call the cops on the creepy guy chasing two children, good job neighborhood watch! Safe and sound they decide to just meet at the Coffman house the next day to get rid of the trouble for good. Of course this happens while a storm is building in the background. Naturally, to set the mood and give you goose bumps. Inside the house they confront Spidey, who actually explains that he is pretty much a mad scientist named Dr. Fritz Fredrick’s. He makes the classic villain mistake of telling his whole evil life story, down to when he was just an assistant to a dark arts master/scientist who created the cursed camera to take souls… yeah souls. But it gets confusing when Spidey, now Dr. Fritz, explains that he stole to camera for his own prosperity, but after it killed so many people he dedicated his life to hiding it so it could not do its evil anymore. So does that make him kind of a good guy? Maybe, but then he tells the kids that they cannot leave because they know too much, implying he is going to kill them too… so I guess he’s not much of a good guy after all. A déjà vu struggle over the camera occurs which leads Shari to accidentally snap a photo of Dr. Fritz. The kids run away but stop when they see the good Dr. is a senseless heap on the floor. They go back down and review the photo, showing Dr. Fritz lying on the floor, eyes bulged, dead. From breaking and entering to murder, see how fast kids can progress. As far as I am aware, at least so far, this is the only human bad guy that gets done in by kids… the only human character that gets killed. I remember this book being one of the scarier ones when I was a young hoodlum looking for trouble. I’m looking forward to seeing what happens way down the road in the sequel, Say Cheese And Die–Again!. Either way this one wasn’t as bad as Monster Blood, and in some sense I still kind of liked it. Below I found the full version of Say Cheese and Die! Featuring a very young Ryan Gosling. Not a whole lot of difference really from the book, except the ending. Enjoy! This entry was posted on October 6, 2012 by David Joseph. It was filed under Books, Goosebumps, Reviews and was tagged with Goosebumps, Monster Blood, R.L. Stine, Say Cheese and Die!, Say Cheese and Die--Again!.